With Valentine’s Day quickly approaching, I decided to make a trip to Albanese Candy Factory in Hobart for some sweet treats for all the sweeties in my life. Coming out of the bitter cold into the warmth of the store was just what I needed on a blustery day. I enjoyed looking at all of the cute Valentine’s Day items, as well as the rest of the beautifully displayed offerings. 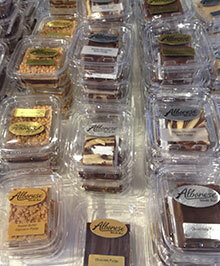 There is always an abundance of new things to discover at Albanese, whether it be candy, chocolate or gift items. 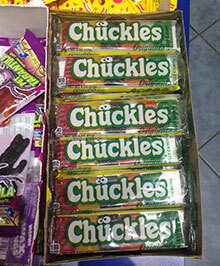 Mixed in with all of those interesting items were a few blasts from my past – favorite candies from my childhood, that is! 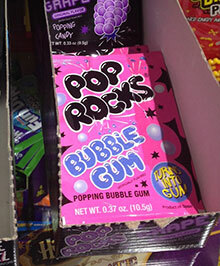 Seeing the boxes of Candy Buttons, Chuckles and Pop Rocks reminded me of carefree days riding my bike to the corner store to buy a treat with my allowance. One display that caught my eye was the fudge display. Containers of yummy, creamy fudge were stacked high to tempt passersby. Fudge is by far one of my favorite indulgences. 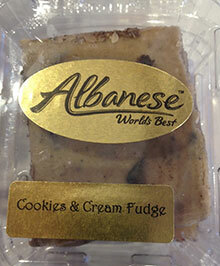 Although plain old chocolate fudge is my go-to flavor, Albanese Candy Factory might get me to consider trying something new. The Peanut Butter Explosion fudge looked absolutely delish, and the cookies and cream variety was equally appealing. Hoping to divert myself from buying everything in the store, I decided to take the self-guided tour that explains how Albanese makes their world famous gummies. Located behind the bins of candy are windows to peek through to see the candy-making operation in progress. There are large TV screens located along the path that show clever videos on the making of gummies. 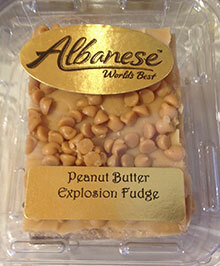 I learned many interesting facts about what it takes to make this delicious candy, such as Albanese uses 20,000 pounds of cornstarch every hour. The cornstarch is pressed with a mold to form little pockets in which the hot candy liquid is poured into. After the proper amount of time passes for the candies to set up, the gummies are released from the cornstarch. Albanese produces 35,000 pounds of gummies every eight hours! I found that amazing. The company also produces delicious chocolates, all of which can be purchased in the store or online and shipped to any location. If you get the chance, swing in to Albanese Candy Factory and check out their yummy candies and array of gift items, and be sure to take the tour. You might learn some fascinating facts about that famous gummi with the “A” on its belly!